The 2007 Acura RL is a 4-door, 5-passenger mid-size luxury sedan available in three trims, including the Sedan, Technology Package, and the Technology Package with CMBS/PAX. MSRP ranges from $46,780 for the standard RL to $53,200 to the RL with Technology and CMBS/PAX Package. The 2007 Acura RL may lack a V8 option, but a powerful 3.5-liter SOHC 24-valve V6 producing 290-hp and 256 lb.-ft. of torque makes up for the lack of an 8-cylinder. The styling of the Acura RL is typically conservative, but displays familiar Acura wedge-shaped lines. The styling of the RL also belies the fact that this is a mid-size sedan, and not a full-size as is typical with other luxury flagships. The mid-size aspects of the car do come into play with rather limited trunk and rear seat space. With plenty of power available at a moments notice, 2007 Acura RL displays excellent handling and drivability. 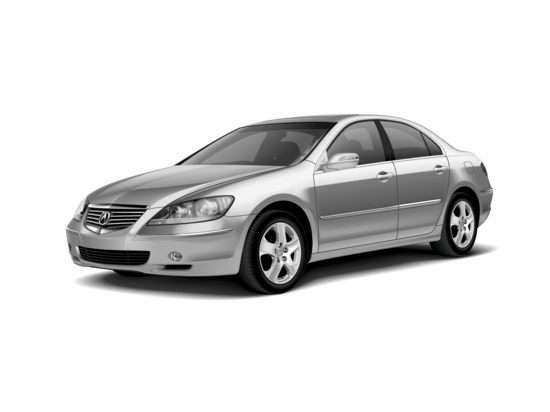 Couple this with the all-weather capability of standard all-wheel-drive and the Acura RL becomes a definite luxury sedan contender. As would be expected of a sedan of this caliber, the cabin is quiet, refined, and overall fit and finish is without equal. The Acura RL competes with the 2007 BMW 5 Series, 2007 Lexus GS 350, and 2007 Mercedes-Benz E-Class. The National Highway Traffic Safety Administration (NHTSA) has awarded the 2007 Acura RL an exemplary 5-star rating across the board; this includes frontal driver and passenger crash testing, front and rear side impact testing, and rollover testing. Standard safety features include driver and passenger airbags with dual threshold dual-stage deployment, front side airbags, side curtain airbags, LATCH, tire pressure monitoring, child-proof rear door locks, vehicle anti-theft, seatbelt adjusters, 3-point seatbelts, trunk anti-trap, and side guard door beams. All three RL trims are standard with a 3.5-liter SOHC 24-valve V6 producing 290-hp and 256 lb.-ft. of torque. All three trims come with a rated mileage of 18-mpg city and 26-mpg highway. A 5-speed automatic transmission with overdrive is standard, as is Acura’s Super-Handling All-Wheel Drive (SH-AWD™). Navigation systems and AcuraLink™ is only available in select markets. The 2007 Acura RL Sedan has a starting MSRP of $45,780. The 2007 Acura RL with Technology Package has a starting MSRP of $49,400. The Technology Package includes Acura Navigation System with Voice Recognition™, rear view camera, and Zagat Survey® reviews and ratings. Also includes GPS-linked, solar-sensing, dual-zone, dual-mode automatic climate control system. Additional equipment includes AcuraLink™ satellite communication system with real-time traffic, Active Front Lighting System (AFS), and maple dashboard trim. The 2007 Acura RL with Technology Package and CMBS/PAX Package has a starting MSRP of $53,200. The CMBS/PAX Package adds Collision Mitigation Braking System™ (CMBS™), Adaptive Cruise Control (ACC), and Michelin® PAX® System Run-Flat Technology. The CMBS/PAX Package is only available on models equipped with the Technology Package.